Trello is a star when it comes to project management software and collaboration tools. It embodies a neat interface with cards stacked up for different projects. Each card can be opened to view more detail such as checklists, labels and due dates. While it is favored by companies with the likes of National Geographic, Google and more, it comes without some basic features that might be critical for most teams. Trello works great as a simple to-do list app however it’s limited when it comes to handling bigger and complex projects. To begin with, Trello does not have built-in Gantt charts, which is considered a necessity for project management by most teams. It can be integrated with external tools to get the job done, but that means additional steps. Second, it does not come with a meeting management module either. This means you need to switch between tools to set up meetings and to monitor tasks. Third, it does not offer time tracking for tasks either. Although not critical, there are time tracking tools for you to have a better idea of how much time a task requires. It definitely helps in project planning for similar projects in the future. For a price of $9.99 per user per month (Premium plan), there are Trello alternatives you can switch to today to get a better value for your investment. Here is a list of our picks to make the switch easier for you. The top of the list of your free Trello alternatives is nTask. Although, you might think we hold a bit of bias towards it, if you check out nTask for yourself, you will agree it is rightfully so. This Trello alternative comes with a spectrum of features that covers all your task and project management needs under one roof. With multiple modules neatly placed on the left panel of a central dashboard, nTask gives you options to work solo or monitor multiple teams with their dedicated workspaces. It gives you issue and resource management, meeting management, time tracking and Gantt charts other than the basic project management feature set. All this, at an incredibly low price and an extraordinarily short learning curve. Looking for the perfect Trello alternative? See for yourself why Trello users are switching to nTask. Create unlimited, tasks, meetings, risks, issue & more. If Trello is a star, Asana does not lag behind boasting about acquiring millions of customers across 15 countries. This free Trello alternative gives you a wide array of features with a clean view making your life as a project manager easier. Whether is a small team locally or you are working with remote teams, Asana makes communication and collaboration a breeze. Like Trello, you can place your tasks and other information as cards that can be dragged and dropped. The timeline makes project monitoring more efficient through moveable tasks with images of the task owners. Plus, communication is simplified with comments, likes and follow. You can also share files and tag a team member in the comments to get their attention. Bitrix24 is primarily an online tool that can also be installed on-prem as your next Trello alternative. Extremely user-friendly, it helps teams in collaboration, manage tasks and projects, and gives you a CRM module for customer support. With a customizable interface, you can create a layout as per your liking. Already winning the hearts of 4,000,000+ organizations globally, Bitrix24 is a promising tool, especially for small teams. Make use of comments, instant messages, chats and group discussions or email. Plus, it is easy to keep ahead of your teams by viewing their activities on a centralized news feed. In addition to basic project management options, it offers a video conferencing option, which is perfect for remote teams. Also, you can save time using their built-in task templates. Task management includes task and subtask creation, time tracking, reminders, reporting, templates, task dependencies and time tracking. Project management options include creating projects and workgroups, Kanban boards, Gantt charts, reports and workload management. Meeting management including setting meeting topic, agenda, description, date, time, duration, location, attendees, minutes as well as attach files. You can add attendees first, and select meeting assistant from one of them after. Extensive options for team collaboration through comments and likes, email, instant messaging, group chat, activity stream, calendars, and workgroups. In-depth Human Resources Management system with attendance management, work reports, workflow automation and employee directory. Cloud storage and advanced document management system. The fourth position on the list of top Trello alternatives goes to none other than Aceproject. This project management tool reminds us a lot of nTask due to its vast array of modules. With Aceproject you can manage your tasks, projects, documents, timesheets as well as expenses. 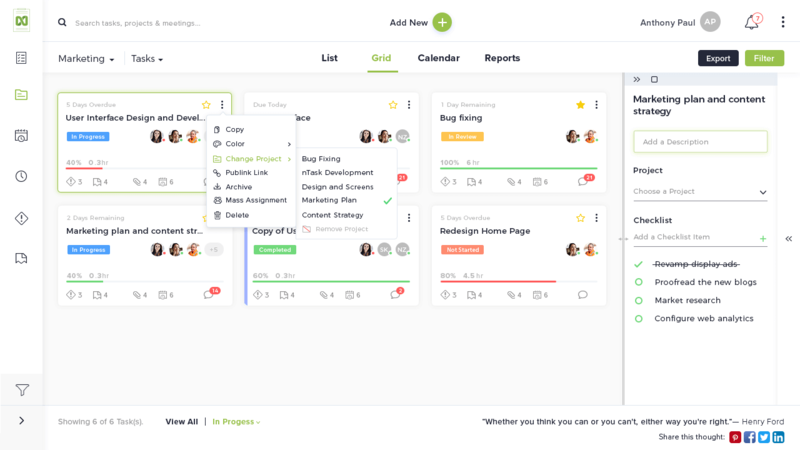 This makes it a great project management software especially for startups and small teams. It has a clean interface for easy collaboration and also offers email updates and notifications. Take your project management game a notch up with Gantt charts, time tracking, and efficient visuals. With so much to offer with a variety of plans to select from, Aceproject is definitely worth a try. Project management including Gantt charts, project and time tracking, project dependencies and in-built templates. Task management including task creation, time tracking, organization, recurring tasks, and customized task reports. Timesheets management module including time clock, timesheet approvals, and advanced time reports. Document management including sharing and storing documents online through drag/drop or simple upload, maintain document versioning and locking to sustain document originality. Expense management including expense type, expense date, amount, code, tracking, approvals and advanced reports with the option of attaching supporting documents. Which app would you rate as the top Trello alternative? Let us know in the comments below.